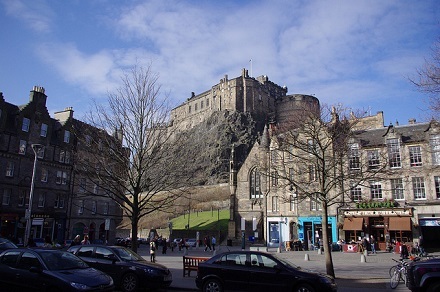 This date in 1784 was the last occasion Edinburgh’s Grassmarket hosted a public execution. One of 15 marketplaces in Edinburgh by 15th century royal decree, the Grassmarket was then and remains today a rectangular plaza flattened between the imposing Edinburgh Castle to the north, and George Heriot’s School for orphans to the south. Edinburgh Castle seen from the western edge of the Grassmarket. (cc) image from Jan Brünemann. For more than a century, since the Restoration, the Grassmarket’s east end had doubled as a public execution theater — although other executions also continued to take place at different Edinburgh venues such as Mercat Cross. But the Grassmarket came online for the gallows just in time to lodge that site in the nation’s memory for martyring an hundred or more Covenanters during the Killing Time. The Duke of Rothes would crack of one such believer who preferred death to reconciliation, “Then let him glorify God in the Grassmarket.” Many did so. 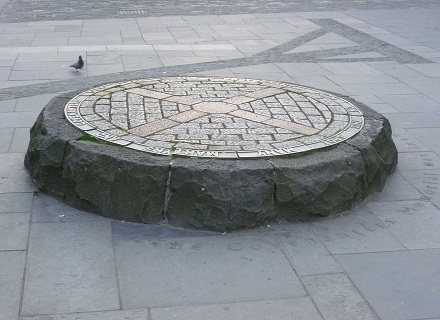 Covenanters Memorial at the onetime site of the Grassmarket’s gallows. (cc) image from Kim Traynor. Just to the right (north) of this view one would find overlooking the memorial the pub named for Half-Hangit Maggie Dickson, who survived her execution in the Grassmarket in 1724. To these souls of these saints was attached a more profane passion in 1736 when a mob incited by an unjust execution rampaged through the Grassmarket and lynched the captain of the city guard who fired on the populace — the real-life events recalled in Walter Scott’s The Heart of Midlothian. As was the case with London’s nearly simultaneous retirement of the Tyburn tree, the milestone occasion dignified the sufferer far more than the other way around. James Andrews was a forgettable minor criminal who hanged for a robbery in the Meadows. The city’s next execution was fully 14 months later. It took place outside the western facade of the Tolbooth prison, which now took over from the Grassmarket as Edinburgh’s definitive public execution site.